I am not getting any younger, I am fully aware of that. Haha. I could act young and feel young but the skin does not lie. Ever. Blame it on gravity. Blame it on age. But sometimes, the blame could also be on you. Neglect could be one of the main causes of bad skin. Oh! And bad products. There are countless brands who promise the world but fails to deliver. Don't get confused, though! When it comes to maintaining your skin and looking younger, trust only the champion in skin care-- OLAY! Olay has been around for years-- 63 to be exact. My mom uses it when I was still a kid (my Aunt from the US would send her loads of Olay products) so it really resonated on me. Fast forward to now, it is still the brand I run to when my skin need some boost and instant perk-me-up. The brand is ever evolving and they recently came up with one of their best products yet, OLAY Miracle Duo! The miracle duo consists of 2 amazing products that when used together, creates a miracle. Of course. You don't need to buy countless skincare products for maintenance, you only need these 2. More savings and less work for us! Yey. These miracle workers should be used after cleansing and toning and before moisturizing. Here's me after cleansing and toning. So much dirt on my face. Eeew. Haha. Time to apply Olay's Miracle Boost Youth Pre-Essence! Love the dropper! I feel like a doctor. Haha. Olay Regenerist Miracle Boost Pre-Essence is the perfect way to jump start your skin care regimen anew by helping boost skin cell metabolism and renewal. The 1st drop of this Pre-essence starts regeneration of a million cells and helps visibly reduce fine lines, pores and firms the skin. It penetrates quickly, leaving behind hydrated, smooth and supple skin. The auto-dropper packaging ensures the exact right amount of product is delivered every application. It is best applied after cleansing your skin as it prepares your face to absorb the next steps of your regimen. 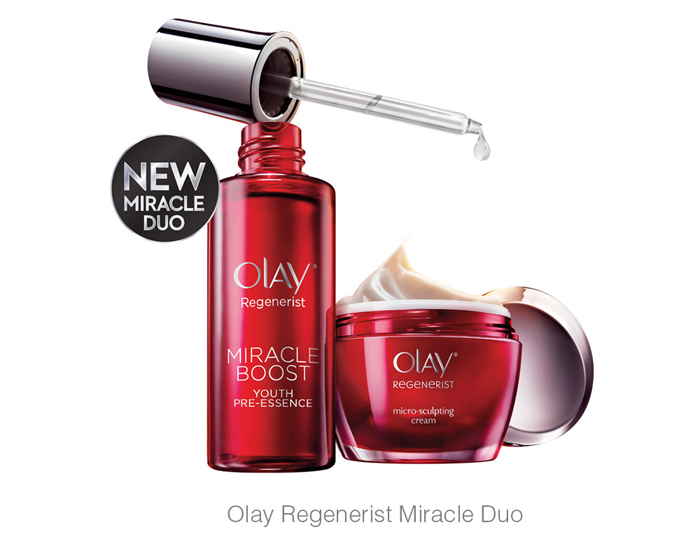 The new Miracle Boost Pre-Essence works best when used with the award-winning Olay Regenerist Micro-sculpting Cream. Pre-essence helps the active ingredients of the Micro-sculpting Cream penetrate deeper into skin for dramatic results. Together, the 2 products form the new #MiracleDuo to give you 2x the epidermis penetration and skin that looks up to 10 years younger! I need this. YOU need this.